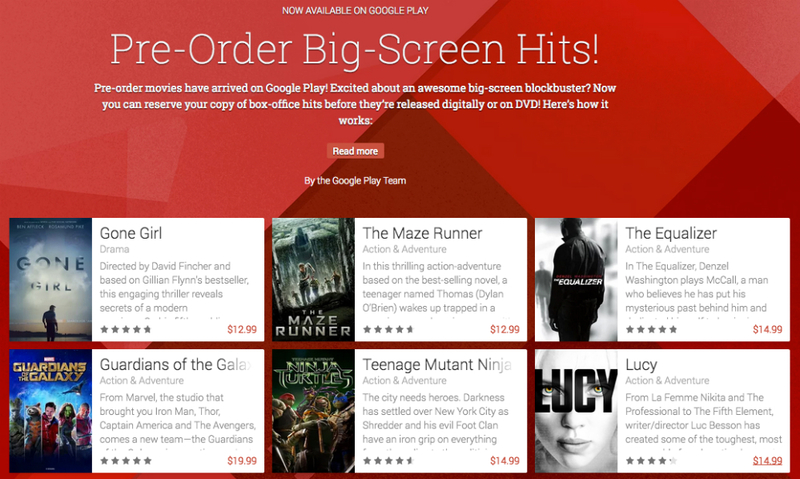 Starting today, Google has opened up a pre-order system for blockbuster movies on Google Play, allowing users to buy their favorite new movies before they are available. Once the movie is released, it will be automatically added to your library and your credit card will be charged. As for which movies users can now pre-order, there is Gone Girl, The Maze Runner, The Equalizer, Guardians of the Galaxy, Lucy, and whole ton of other titles that are not yet publicly available for purchase. Follow the link below to start reserving your digital copies. HTC "Double Exposure" Event Live Blog (With Live Video)!